The traditional India-UAE relations that grew over the ages have blossomed into a comprehensive and strategic partnership and the upward trajectory received a further boost with the recent visit of Shaikh Abdullah Bin Zayed Al Nahyan, the UAE’s Minister of Foreign Affairs and International Cooperation, to India. There has been a remarkable progress in the ties since Indian Prime Minister Narendra Modi paid a visit to the UAE in 2015. The upward trajectory finds reflection in the series of high-level visits from the UAE over the last three years, starting with the February 2016 visit of His Highness Shaikh Mohammad Bin Zayed Al Nahyan, Abu Dhabi Crown Prince and Deputy Supreme Commander of UAE Armed Forces, and in the following year, his gesture of accepting to be the chief guest at India’s Republic Day celebrations on January 26. The bilateral engagement is growing from traditional trade and business with both sides agreeing on facilitation of institutional investors in infrastructure, cooperation in renewable energy, cooperation in combating cybercrimes, cultural exchanges, space, skill development, insurance and currency swaps and some strategic issues. Anwar Gargash, the UAE Minister of State for Foreign Affairs, has also been to New Delhi to help plug the gaps in bilateral cooperation. During the June 24-30 visit of Shaikh Abdullah, both sides reviewed the extent of cooperation. At a bilateral meeting with India’s External Affairs Minister Sushma Swaraj, the two leaders had frank discussions on both regional and international affairs, while two significant Memoranda of Understanding (Mou) were signed, including a trilateral MoU to set up a refinery in India. Shaikh Abdullah also called on Modi and they discussed existing cooperation across various fields and steps required to take them to the next level. India and the UAE have a comprehensive strategic partnership with special emphasis on combating terror and extremism. India’s Ministry of External Affairs underscored the visit of the UAE foreign minister as giving an opportunity to both the sides to constructively build on the vision of the comprehensive strategic partnership and to fast-track decisions on cooperation in the areas of trade and investment, defence and security, energy including renewable energy, cultural, consular and community welfare issues. Following up the decisions taken during the visit of Modi to the UAE in February, both sides reiterated to work together in select countries of sub-Saharan Africa in areas of priority to them, particularly through capacity-building initiatives, joint developmental projects in agriculture, information technology and information technology enabled services, health, renewable energy, infrastructure, etc aimed at supporting the achievement of Sustainable Development Goals. India is the largest trading partner of the UAE with trade standing at $52 billion (Dh191.25 billion), in 2016-17, while the UAE is the third-largest trading partner for India after China and the United States. With more than $30 billion, UAE is the second-largest export destination, while it has invested some $8 billion with little over half as Foreign Direct Investment and the rest as portfolio. Besides the official engagement with India’s national leadership, Shaikh Abdullah toured the states of Gujarat, Maharashtra, Telangana, Tamil Nadu and Karnataka where he met both state leaders and business delegations. In a separate meeting with India’s Minister of State for External Affairs M.J. Akbar and National Security Adviser Ajit Doval, both sides discussed the growing bilateral ties. They also discussed ways to develop existing cooperation, issues of mutual interest, regional and international developments. The efforts of the two countries to support stability, peace and joint coordination in countering extremism and terrorism also figured prominently during the talks. Both Swaraj and Shaikh Abdullah attended the exchange of MoU in the field of diplomatic training between the Emirates Diplomatic Academy and the Foreign Service Institute of India. The UAE Ambassador to India, Dr Ahmad Al Banna, and the Joint Secretary (Gulf) at India’s Ministry of External Affairs, Nagendra Prasad, signed the MoU. Al Banna said the special relationship was reflective of the vision of the leaders. He hoped the visit would further enhance the people-to-people engagement and promote soft power and cultural exchanges. The UAE announced its decision to set up a consulate in Hyderabad, Telangana, a state that sees considerable number of people travelling to the Gulf countries either for work or for leisure. Energy cooperation is one of the cornerstones of this bilateral engagement. During the visit, Saudi oil firm Aramco and UAE’s Abu Dhabi National Oil Company (Adnoc) signed an MoU with a consortium of three Indian oil companies to explore a strategic partnership and co-investment in the development of a new $44 billion mega refinery and petrochemicals complex at Ratnagiri, Maharashtra. Minister of State and Adnoc Group CEO Dr Sultan Bin Ahmad Sultan Al Jaber, CEO of Saudi Aramco Ameen Nasser, Indian Oil Corporation chairman Sanjiv Singh, Hindustan Petroleum CMD M. K. Surana and Bharat Petroleum CEO D. Rajkumar signed the framework agreement while Ratnagiri Refinery and Petrochemicals Ltd (RRPCL) CEO B. Ashok was at the signing ceremony in the presence of the Indian Petroleum Minister Dharmendra Pradhan and Shaikh Abdullah. Shaikh Abdullah said that the agreement strengthens the already close ties between India, the UAE and Saudi Arabia. He said it reflects the unwavering commitment of UAE to its strategic multi-lateral relationship with both Saudi Arabia and India. “We look forward to exploring further opportunities to expand our energy partnerships and to collaborating on new, broader opportunities that will further strengthen and deepen the long-standing economic links between our three countries”, Shaikh Abdullah observed. The agreement defines the principles of the joint strategic cooperation between Saudi Aramco and Adnoc to jointly build, own and operate the complex in collaboration with a consortium of Indian national oil companies. Saudi Aramco and Adnoc will jointly own 50 per cent of the new joint venture company, the RRPCL, and the remaining 50 per cent will be owned by the Indian consortium, the UAE Ministry of Foreign Affairs said. “This project is a clear example of our expanded downstream strategy, where we will make strategic, commercially-driven, targeted investments, both in the UAE and abroad. By investing in this project, we will secure off-take of our crude to a key growth economy, as well as one of the world’s largest and fastest growing refining and petrochemical markets”, Al Jaber said. The strategic partnership between Adnoc and Saudi Aramco marks a significant step in regional energy partnership and cooperation, bringing together two of the world’s leading national oil Companies as strategic partners with the Indian consortium. It will also combine their considerable expertise spanning crude supply, resources and technologies, along with an established commercial presence and global reach. The parties would execute a pre-feasibility study to determine the project’s overall configuration. Ameen Nasser, Saudi Aramco president and CEO, emphasised the joint venture’s visionary focus. “World energy demand is expected to grow exponentially by 2050, driven in large part by India. Saudi Aramco is proud to collaborate with Adnoc and RRPCL to help ensure that the world’s fastest-growing economy has secure, reliable, energy feedstocks for its long-term prosperity. The Ratnagiri project will meet India’s rising demand for fuel and chemical products while serving the strategic objectives of the partners. I am pleased that Saudi Aramco will deepen its engagement in India’s fast-growing oil-and-gas sector through this project that also positions us for future collaboration as a key element of our company’s global downstream strategy,” Nasser said. 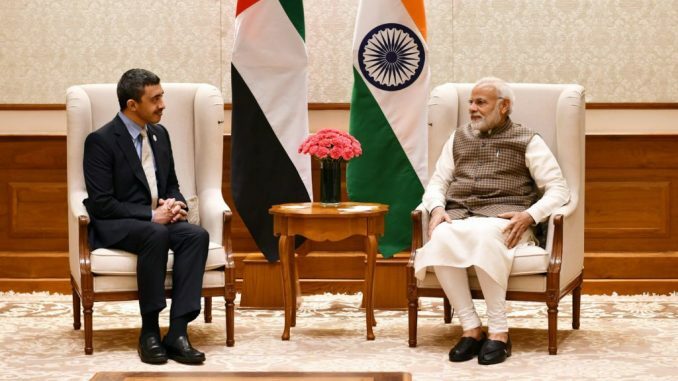 Significantly, both the UAE and India officially described Shaikh Abdullah’s visit as special and defining in strengthening the friendly Indo-UAE relations, with Ambassador Al Banna saying that India and the UAE are partners in peace and economic growth.